Burden Point is a real place though, and those tracks support a loco Amtrak racing by many times daily. Info on the Burden follows. Another place freighted with evocative name and debris is Port Ivory, just slightly to the west of this foto. Makes you wonder, and I think that’s good. The charts mark Pot Cove as near near here. I had to make the fotos somewhat interesting. 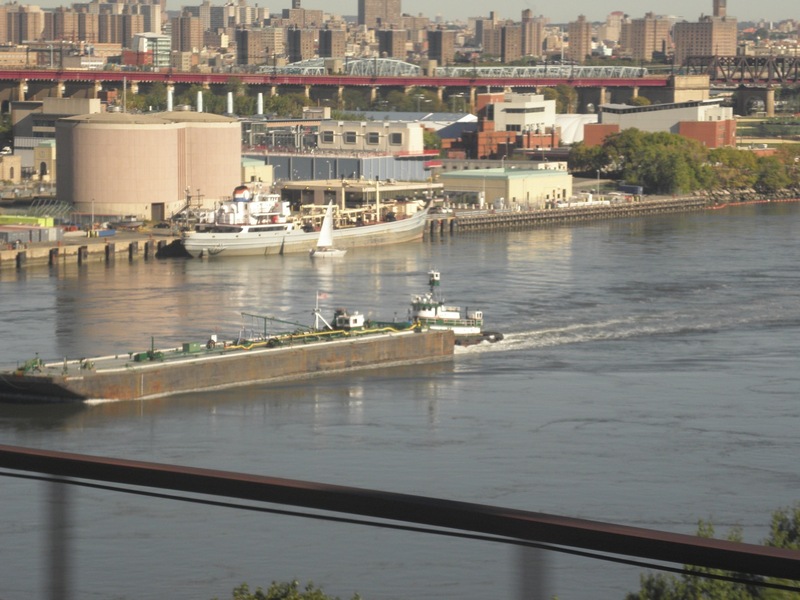 By the way, that’s tug Quenames sliding a barge under the rail bridge near Hell Gate, and beyond her starboard is the Bronx, DEP sludge central, possibly sludge tanker North River. And one last rather uninteresting foto . 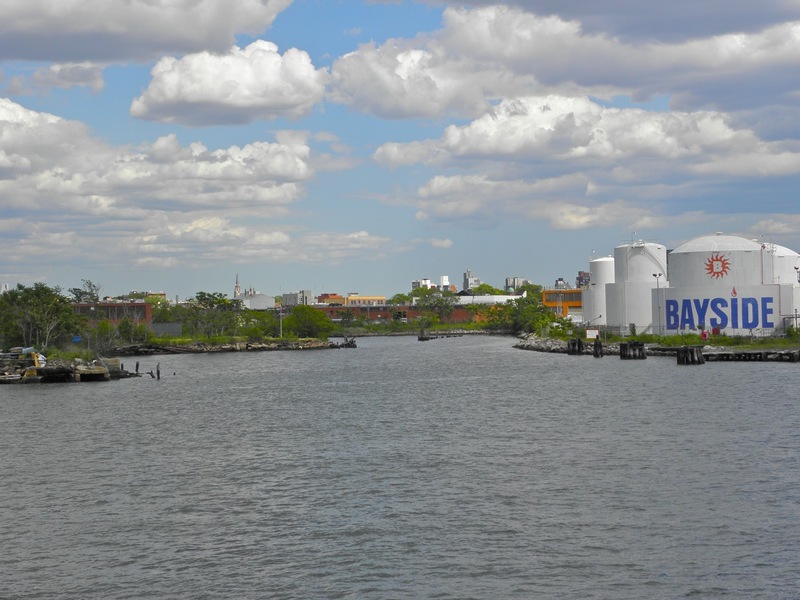 . . Bushwick Inlet poking into Greenpoint, Brooklyn from the East River. Know how this place is connected with Burden Dock? 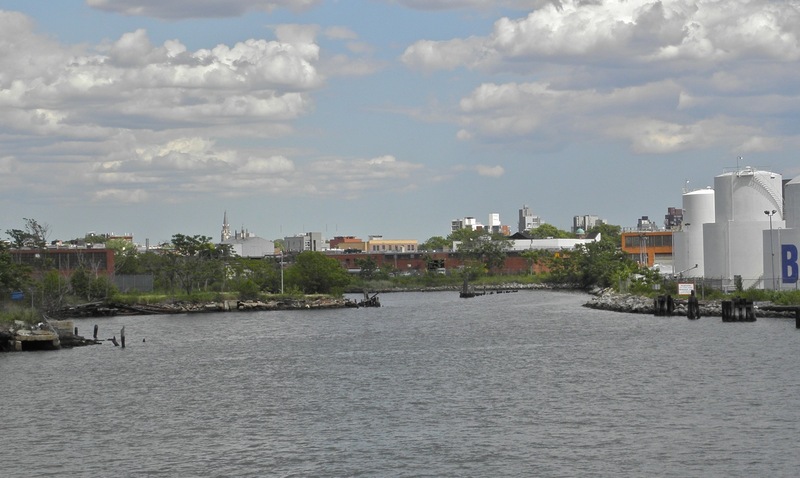 Bushwick Inlet was once the home to Continental Iron Works, where the ironclad Monitor was built. And the iron used in the plate, well, that’s the Burden connection. Burden Dock is named for Henry Burden, one of the Hudson valley’s most prolific inventors with iron, a name I didn’t know until I started digging prompted by the weary dock name I spotted last weekend. Burden made superb train wheels and horse shoes for the Union army as well as iron plate–shipped downriver from his iron works in Troy–for the construction of Monitor. The hills inland from Burden Dock supplied ore for all Burden’s projects. See p. 13 of this issue and p. 9 of this one for references to Burden’s Hudson River Ore and Iron . . . although that whole magazine has enthralling articles in it. Kudos to the Columbia County Historical society. Interesting also is that Hudson River ore was superseded by that from the Mesabi Range. 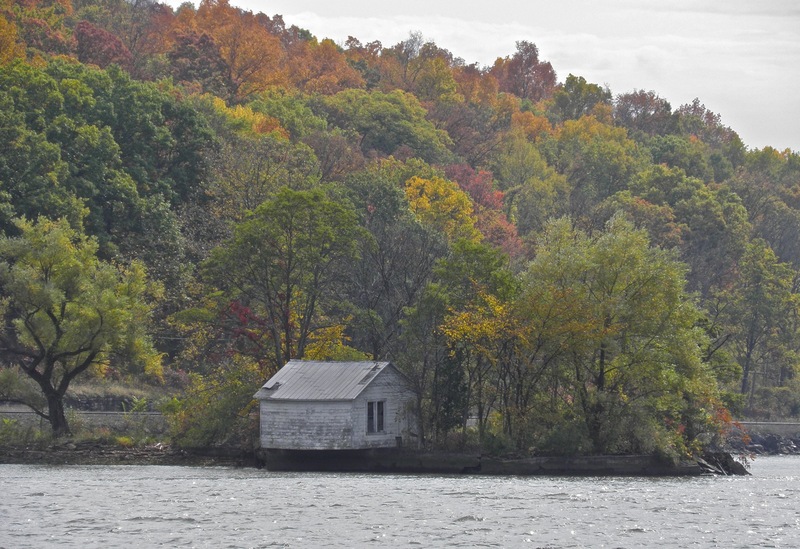 Now without that name and a little wild debris–a shack on a barge or dock transforming itself back into wilderness–I’d not have felt invited into this past. I’m grateful for the names, at least. Port Ivory has this story, better smelling though less fabulous than you might have imagined. Pot Cove was once a native village. Upriver are Anthony’s Nose (maybe named for the proboscis of Peter Stuyvesant’s aid Anthony Corlaer and Kidd’s Cave. Mr Stuyvesant himself enjoyed a well-endowed proboscis. 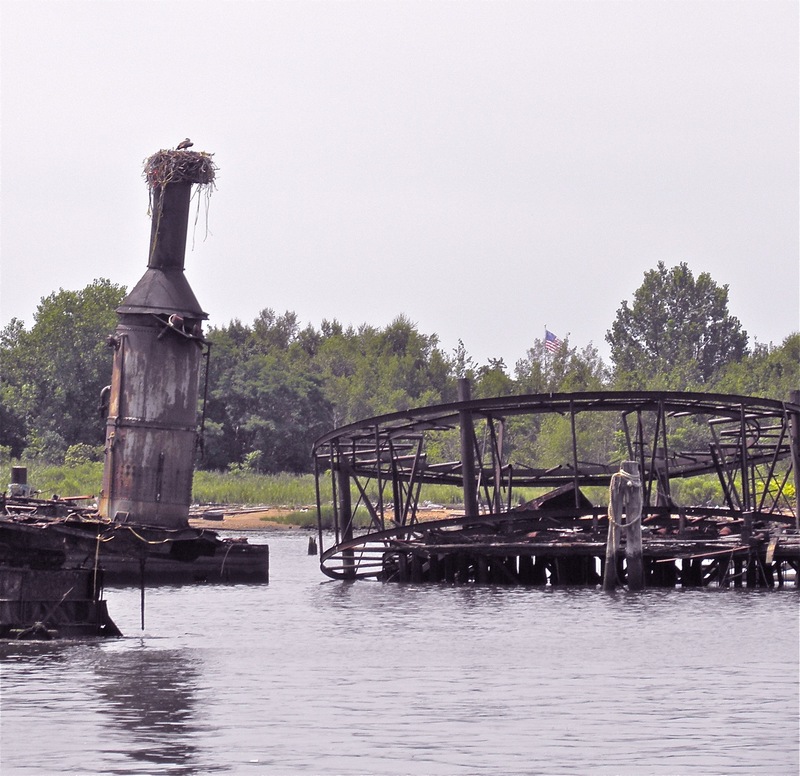 Tugster wish list: Can anyone share scans/fotos of the ghost fleet off Jones Point (at the base of Dunderberg Mountain) from the mid-60s to the early 70s. In 1965, 189 vessels were anchored there. Tangentially related: The sixth boro is dotted with an archipelago of islands from the famous Manhattan to the obscure Hart, where Melinda Hunt has brought the dead to life. Spot on related: Check out hudson river explorer, Dennis Willard’s blog. 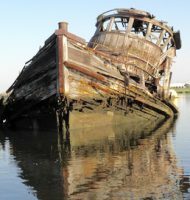 Finally: A tip of the hat to Rick of Old Salt Blog for his compendium of haunted ships . . . for tomorrow. I’m off gallivanting up the Hudson Valley for Halloween. when i find the URL’s again i’ll directed you to where you can download both waston’s and beer’s atlas’s of the hudson river,both published in the late 1800’s . . .
we’ve probably crossed paths many times out there between beacon and new baltimore this summer while i’ve been taking photos of river town from both land and water . I would leave a note on the Liners List at Yahoo. It’s a great place for info. Does Shipspotting have anything? Have you asked at Manhattans World Ship Society New York Branch? Just thinking out loud and perhaps obviously. This link is to the Sea Classics Article about the mothball ship storage sights.